Check out my video on my profile! being tob a champion not easy need hard working. The sjb was awesome it was my best performance to date ! Loved it! And it was in my hometown. Everyone i talked to that day were friendly!! Glad you enjoyed our San Juan Double. You ran well. Should have run the double run, did a charity run in Campbell instead on Saturday because the cause was important- but they forgot to put anyone at the turnaround and we all ran significantly further than 5k-- Organization matters! Headlands Endurance Run 75 miler, 15,000 feet elevation gain. It was like a Double, where I completed 100K for first leg, took a 1 hour plus half time break, then did half marathon for 2nd leg. Only difference is that my break time was added into the finish time, which makes me look like a real snail!!!! Learned something last week--always double-check that you are indeed entered when you sign up for a race at an Expo. Signed up for Santa Rosa Half at Oakland half expo. Made plans, trained, then came to find out four days before I was never entered. They had lost my entry form. And now the entry fee is way past my threshold. Well,, made the most of it by trashing my quads in the Coast Diablo Mountain 10 miler instead. fun climbing 2900 feet up a gorgeous peak. no harm, no foul but glad I checked before heading to Santa Rosa! Getting psyched for the National 50K Trail Championship race coming up this Saturday at the Golden Gate Headlands. Race starts in Santos Meadows at Muir Woods. Course runs to Rodeo Beach, through Tennessee Valley, climbs up to Cardiac Hill, then down to Stinson Beach, back up to Cardiac Hill, and finally finishes with a nice, challenging downhill back to Santos Meadow . With 7,300 feet climbing, it's a tough grind, but I hope to finish under 8 hours. Disappointed that I took wrong fork in 6K, following the 1:58 pacer who left me in the dust. Went too far out, doing extra mileage. Did not arrive early enough to warm up for 10 miler and had to start with fast group. Guess I was not ready for this race, so used it as a workout. This was a great learning experience for me. Thanks Bob for challenging me...I have a lot of work to do. My training has been sub par due to sciatic pain and other issues, but I truly feel blessed to be running at my age! Has anybody come across a PROMO discount code for the upcoming San Jose Double Road race on 8/20? Good to hear from you Nancy. Sorry, but only actual races can be included here. But do it anyway, good training. Hope you are well!! Thanks for the feedback Bob. I am doing great; thank you for asking. I pray all is well with you too. I normally follow my daily schedule, I will not train out of the program. when hard time comes hard people remain, I will remain hard always. Finished Boston 2 Big Sur Double Marathon with a combined time of 9:22:09 and at a 10:43 pace. My Boston time was 4:38:32 and Big Sur time was 4:43:37. So after a 6 day halftime, where I did tons of walking daily plus a 4.5 mile run on Weds nite in Boston; I slowed down only by about 5 minutes for a much more challenging course. Good luck everyone at the Sac 10 miler. Got some insights this weekend, you can run a fast road race the day before a steep trail 10k but not the other way around :) After Grizzly Peak 10k yesterday, (gorgeous run in Berkeley hills but so steep) today's all about a very easy, slow recovery run -- good thing I didn't pre-pay for any races today! Here in Sacramento relaxing before my 10 mile race tomorrow AM. This coming Sunday at 2am our clocks need to move forward by one hour. Don't be late to your race Sunday morning. Palo Alto Double 8k is this Sunday. Took my first trip to California for a double dose of excitement. I watched the Olympic Marathon Trials in person on Saturday and ran the Los Angeles Marathon on Sunday. The course was an adventure since I'm not used to hill racing. I went into the race with a hamstring injury, so I didn't run for time and took it easy. For once I was able to enjoy the scenery of a race and enjoyed every minute of it. Been getting in 40 miles a week of Double-Style training. I am hoping to be in better shape for our upcoming San Jose Double Feb 20. See you there! Time to get back on track!! Signed up for my first race of the year. And I surprised myself by joining the Treadmill Triathlon Club. It will be a new adventure for me. So Excited. I'm planning a trip to California next month and I'm looking forward to my first Double Road Race in San Jose on Feb 20th. Merry Christmas everyone! Be sure to get in a Christmas Day and New Year's Day Run. Commit yourself in hardworking and eventually your performance will light attract more funs. Anyone running the Double Road Race tomorrow who is coming from Oakland? I need a ride! Looking forward to trying to keep my daughter Lauren in sight for the double sprint tomorrow. with my late season injuries my pace resembles more the tortoise right now so it will be fun to see how far ahead she can get with those speedy 13 year old legs! I went to the gym today. I walked the treadmill, did free weights and machines. Did you know that clinical massage therapy can really help your running form? OMG - so helpful! 200m interval workout, then off to celebrate Veteran's Day at VFW Manteca. Happy Veteran's Day to all you Veterans and thank you for your service! I love running in a free country. Well said Eldon. Wishing everyone could run in a free country! Going to test my fitness this Saturday evening on a dirt 5k course nearby. Certified course, fairly flat. Fitness level is getting better as I am getting ready to run the National Cross Country Race in S.F. this Dec. 12th. Last race wearing a WVJS singlet! Had 'Serious Fun' at the Headlands Endurance Run this last Saturday and Sunday in the Golden Gate HeadlandsI. Completed 3 25-mile loops for 75 miles and the Women's Course record... I am the only woman to have ever completed the 75 miler!!! I did a 21K Double Training Run yesterday. I first ran 15k (9.3 miles) from my house to Stanford. At 9.3 miles I started walking and by 10 miles I was at the Coupa Café on campus. I ordered a banana, a bottle of water and some chips. It was my personal halftime. After about 20 minutes I started walking again (I was enjoying my halftime). The second 6k stage would start as the rules state...two hours and 30 minutes after the start of the first leg. I walked a mile or so before the clock hit 2:30. I started running again. I certainly felt better than when I stopped after only about a quarter of a mile. But I hit the wall about two miles later. I did finish my 21k Double Training Run and I have a time to beat..two hours 3 minutes and change. Give it a try! Can you get the Coupa Cafe to put in a refreshment station at your future Bay Area doubles? Had an awesome day Saturday running the Tamalpa Headlands 50K USATF National Trail Championship race, in spite of forgetting to bring my trail shoes. Had to run in the Vibram Fivefinger shoes I was wearing...it was actually raining!!! when the race started at 7:30AM, so that made the already difficult course even more challenging. We had to climb 7300 feet over roots, rocks, stairs and muddy, slippery conditions. Actually had a close call as I slipped off the muddy trail into the bushes on a cliff, sliding down head first...but miraculously stopped myself at a fallen tree branch and was helped to my feet by a hiker and a runner who was following me. In spite of this adversity, ran my fastest time on this course at 8:11:28 and snagged 1st place in the USATF Championship for Female 60-64. Coming up a week from Saturday is our 5th San Jose Double Racing Festival (Sat Aug 22) presented by IDT. Packet Pick Up is Friday at Road Runners Sports in Campbell noon to 6pm or race morning 6am to 7:15am. Good luck to everyone running our Golden Gate 8k Double Adventure Run on Sunday Aug 2. There is one tough hill near the start of the 5k leg. Then there is a good downhill about a mile and a half out. Half on roads and half on trails. The GG bridge is in view most of the way. The 3k leg is all flat. Weather forecast is good. Packet Pickup at ARM in San Francisco on Saturday 2-6pm. Or race morning from 6am to 7am. We have a few spots left if you have not signed up. Way to go Risper. First female at Wharf to Wharf 6 miler. You make us proud! fast young man and respectful and friendly as well! Inspiring runner! Ben is a really nice guy. Second overall at the Palo Alto Double 8k. He is only 15. First, thank you Bob for a very fun double 8k event in Palo Alto, hope it stays a regular on the schedule and that next year, I can participate healthy... note to self, when the Achilles barks, listen... luckily I didn't end up with a full blow tear, but rather a hamstring pull that will take less recovery time... Swimming anyone?? That fixed it. Thanks so much!! Canyon Creek Park sounds like a blast going uphill on dirt...that's my kind of workout! I'll see ya all there!!!! Double Training Run tonight (July 9) at A Runner's Mind in Burlingame at 7pm . No cost. Can you join me? Next Double Racing Event is happening July 19 in Palo Alto. Half trails and half paved roads. Good course! Double 8k (5 3) and Kids Cup Double 1.5 mile. Flat and fast. Good luck on Sunday at the 3rd Annual Overland Park Double Road Race. See you there! I am proud to be the 2015 double race 5k in ft Lauderdale this year. Hi Bob... Just wanted to say my wife and I watched your movie today and it was fantastic! Makes me want to get out and run even more! 49ers.com/news/article-1/2015-Golden-Voice-Anthem-Contest/3dd6a3af-5948-4d4a-a8b0-c91aa7ac4fc7 Please vote for Noah Kibreab! Well it has gotten to the point that my back, left leg problem is to uncomfortable to run on. So will just walk for a few weeks and see if things improve. Walking is is great way to rehab...good luck with a speedy recovery! I an very happy to say that I ran my personal best 10K in Marin on Monday...not only did I get a PR, but I also broke into the 80% age grade for the very first time in my running career... Indeed, this was a Peak Performance! But I need to thank my competition, Bob Lord of WVJS, for pulling me to this Peak performance! Congrats Kat. Breaking into 80% age-graded is moving to the next level. Way to go! Got in 33 miles over the weekend (Saturday-Monday) at about 9 minute pace. It felt good to get in more miles than I have been doing. I even worked in four quarters at about 1:35 each. My legs feel it today! I feel bummed that Sunday's Ohlone 50K trail race has been canceled by EBRPD authorities due to Thursday's thunderstorm that dumped about 1/2 inch of rain and made the access roads impassable to emergency vehicles. Oh well, I can now spend Sunday in my garden transplanting the 9 Heirloom tomato plants, and the kale and broccoli that I purchased today at the Farmer's Market in Saratoga. getuponit.org/blog/2015/5/4/sweet-hayah-to-the-beat-of-their-own-drum Catch Sweet HayaH at the PG Double Racing Festival on May 10. I really like the music of Sweet Hayah! How many Double Racing Festivals have they played at so far? See everyone this weekend. Congrats to all our members who ran the Boston Marathon. Was the weather as tough as what the news reported? Ujena Fit Club member Meb Keflezighi finished eighth with a time of 2:12:42. 2015 Bali Double Road Race Results are posted. https://www.doubleroadrace.com/o.php?pg=Bali2015Results . Laura it was nice meeting you. Congrats on being our overall female winner this morning at the OKC Double Road Race. Congrats on winning the Double Victory Cup (best age-graded score) and the overall win this morning at the OKC Double Road Race! Off to Oklahoma City for the OKC Double Road Race April 4. See you there. Michael and I did a Double Interval workout yesterday. In total we covered eight miles. Four of it on the track. We ran two laps at about 7:55 pace, jogged half lap and then ran one lap in 95 seconds. Walked a half a lap and did this four times. Good workout. One caveat from my experience: A beginning runner may not understand the importance of glute involvement. I injured my knees training for my first marathon because I had always run with quad and hamstring strength. When my long runs went over 2:30, I lost knee stability and caused quite a bit of damage. Fortunately, with accurate diagnosis and improved technique I was able to overcome the problem. As my running progressed, I enjoyed moving from the mental state of merely trying to figure out how to finish, to thinking about strategy - whether I could implement it or not! I am the second of five boys in our family. We were all very competitive even at the dinner table. Dan I only had 3 brothers, I was the youngest of the 4; and I out did them all, but I look up to them to this day. Still it was a great day when I kicked their A.
I grew up in a family of 5 boys, I was number 3. Everything we did was a race; how fast can you do that? I run every race knowing I gave it my best effort. Richard great article, do we (runners) all have some of the same issues as we go through our lives? I have never trained like I should, I just use the gift God gave me. When I run, or workout I race or max out the workout. It always ends in injury or burnout. Thanks for the story it's going to help, the rest is up to me, and a good coach if I'll listen, and learn. Interesting insight to my 50 race challenge in 2012. Thanks Rich for always being there and helping me out. Our movie A Long Run is being released in a couple of weeks. Congrats to all our winners at the Manhattan Doulbe. Joe Moore ran the second fastest time ever. He posted 44:48. The field at this year's B.A.A. Half marathon is top notch like last year. Kim Smith from New Zealand is in top form...she won the women's race last year in 1:10:57. Flat and fast. Great race to PR. This race was so much fun. It was one of my 50 races in 2012 and I loved it. Make sure you put this on your bucket list. Dr JoAnn will be running on Saturday...have you read her advice...I follow her advice because it works!!!! Thanks JoAnn for sharing some great ideas. You have really helped me be a better runner. Looks like a great race. This is the third Double of the year...good course...good competition! This is a really good race...ran it last year!!! Hal Higdon always has good advice to offer...what do you think? Happening this Saturday...has to be one of the toughest races anywhere. Has anyone here run it? My age-group winner takes 22 hours to complete it. I think it would take me at least a week! But I am sure there is a time limit. Risper, one of our top Ujena Fit Club female runners, was only one second behind the winner last year. Risper ran 32:23 and placed third. It was a sprint to the finish. Her coach and husband George, told me she is rested and really wants to win this year! Go Risper!!!! This is one of the biggest races in the country...nearly 58,000 finishers last year!!!! Who else is running? I really like this half marathon...I have run it three times. I am going to miss this year because I will be in Denver for the Double Road Race. Otherwise I would have been on the starting line again. Make a plan to do this one!!! 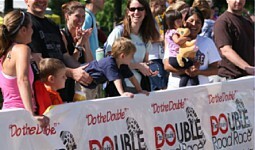 The weather forecast for our Overland Park Double June 30 is good. Not going to be too hot...65 degrees at 7:30am and 74 at 11am. That will work!!! Lots of good times in Duluth over last weekend. I have always wanted to run this race. It was started 35 years ago and they do a half too. Some very fast times there. Have you run it? Excited to have Josh, this year's winner running our Overland Park Double June 30th...good luck! Almost 6000 finishers in this all women race. Should there be all men races? just asking. Al Gordon is a nice race, a bit hard to park if driving since it's a Saturday. Course is nice with one major uphill in the beginning and then rolling. Weather can be cold! I really enjoy this 8k race in Palo Alto. I would run it in a heartbeat however this year I am going to be out of town. Running the Ujena 5k that day in Cancun. Several Ujena Fit Club members are running this marathon including Fernando Cabada who wants to get under 2:10 which would bring him up to the next level. Good luck Fernando!!!! I ran this race about 15 years ago. I think it is a fast course...I hope so! This will be race number 42 for the year!!!! Met several runners from Eugene area that are running this marathon. Good luck to all of you! I know that at least one of you are running your first marathon ever. Don't go out too fast! Good luck Roger...This is one of the fastest marathon course in the world!!! Just watched the course video again...looks like my type of course. Some downhill in the beginning and the hills in the last two miles don't look too bad. I checked the weather report and they are saying 69% humidity and 70 degrees. Sounds okay! Or you can turn a garden hose on your legs after a run. An old horse trainers trick. Jack Foster the great masters runner from NZ used this all the time. I have never been able to listen to music while I run. I think for the most part its because I dont like to cary anthing bigger then my watch with me. I also dont want to get used to it because we are not allowed to take the PT test with music so I figure its best to just get used to running silently. Not for me. I enjoy the sounds of nature - particularly in the morning workouts - and the greetings and encouragement from other runners on the trails. The only time I tired listening to music while running was in 1965. I had a little transistor radio with an ear plug. This was before iPods. After about a mile I took it out. It was just taking too much away from my run. On the other hand, I do like running the Rock n Roll races with music every mile or to run the Bay To Breakers with music at spots along the way. BUT I just don't like it every minute in my ear. Never have and never well. How about you? I have thought about trying these socks...I know that Ujena Fit Club member Meb swears by them...any other members wearing them? This is a very intresting article. Reading through this I thought back to a few times when I cut my workout short or just didnt run and some of the times when I just didn't want to run but did. I never really though about why I ran and why I didn't but after reading this article I relized the answer to that question. The days I quit or didn't run I had no reason to run besides just running the days I pushed myself to run was to prepare for a upcomeing race. So I defiently think this article is a great one and is defiently true. I have been using my garmin to keep track of logs and its really helped me keep my motivation levels up along with preparing for my races. I used to run without loging my runs and in every case I would quit after a few months. I think its very important to keep track of your progress in order to keep going with your workouts. I have been keeping a diary for years. It has really helped me get through injuries (knowing what I did before) and to plan for races. I also now post deaily on the Ujena Fit Club. I know I have run a lot of extra good miles because I want to reach the next level of points. How about you? Wow! Your have had lots of practice at your pre-race routine this year...got it down pat! Like to see enough effort in your warm up to break a sweat...very important. Thanks Steven. Hope you are recovering well from your marathon. I love this article because it relates to the past two weeks for me. I have not felt good at all for the last two weeks. I continued on even though my miliage was lacking and then ran a marathon. Even though I felt bad for two weeks and I just new I would do terrable on the race I ran it anyway. Ended up setting PB times from 9 miles up in once race. Of course anything over 13.1 miles would be a pb no matter what time I got. Just like you said in the article een though you feel bad and it seems you are not improving you are. Dont let the bad days force you to quite! Luckily in age group competition you are running against others who are going through the same thing. I was a good uphill runner but could really turn it on going down hill ( sub-5 pace or faster). Not any longer. I would imagine as you get older you start to loose alot of muscle in your legs. going down a hill requires alot less effort on the muscles and puts more strain on the joints and bones. You have been running so long that your bones and joints are used to the impact but no matter what you do you will lose muscle as you get older and will have to work that much harder to keep it. Do you incorporate any specific hill training in your workouts? I was a much better hill runner when I was younger...I can still really hold my own racing down a hilll but up a hill is another story...I wonder why it is different now? Only one change to your comment, Bob, "was" should be "is". :) What Ken did for course standardization and record keeping is about on-par with what you did in expanding the knowledge base of running. I measured courses for the TAC and the Pacific Association and we used a calibrated cycle. It was a burden as far as time was concerned but we knew the courses were accurate. I don't believe Garmins and G-Mapping is as accurate. From what I understand viren was the master at being precisely at his best fitness for the biggest races. Ahead of his time. And about the ave course, ken young certified it. He rides a calibrated bicycle (with people on radios on either side of the turn) in just the manner that barry described. From the way ken talks every course measurer SHOULD be doing it the same way. Pre would have had to shift to the 10k. He might have medalled there but not in the 5k. That turned out to be a kickers race which Viren won. But it was a near thing by his own admission. I believe they measure the shortest distance that you could realistically run it without other runners to contend with. So many folks seemed zoned out and are just staying in a particular lane--maybe they think it would be rude to cut across, and it is rude if you are cutting off other runners to do it. The timing of this article was so perfect. There were a lot of turns in the Ave of the Giants half marathon on Sunday. Most runners did not follow this advice, I did. I know it helped. My question, how do they measure a certified course? I totally agree Richard...the bronze maybe but not the gold or silver. Viren was the best runner and racer on that day and 4 years later. Much faster than people have given him credit for. He could really put the hammer down for a long push to the finish and would consistently run 1:55-1:57 for the last 800...even in the 10k. Think he may have also placed 5th in the 76 Olympic marathon...good range. If Pre did as you say I doubt he would have won but he might have nabbed that Bronze he lost is the last few meters. Viren was the better runner that day. As long as you don't get caught Bruce. As I remember, Ward Parkway is kind of a winding road so this may have been a good tip for that race...even through it is pretty simple. I have also seen it work well in track meets on staggered starts. You are running well—keep it going. Right Bob, and I saw lots of folks at Rock The Parkway just staying in their lanes like the car traffic would do, not finding the tangents--I knew you were not one of them as you sped to the finish the straightest possible. Barry, I try to practice your technique ON THE WAY TO THE RACE, if not too much traffic--is that appropriate? Before my last race I did 2.25 slow about 45 minutes out then did a few real short strides about 20 minutes out. Was the longest warmup I have done but I also had the best race time since I started back. I saw Steve Scott before the start of the Carlsbad 5000 a couple of years ago. He told me that he had to warm up a lot more since turning 40...I think that day he ran a sub 15 5k!!! MY thoughts on pacing are the longer the race the more important pacing becomes. In my case with many years of racing experience under my belt the 1st mile of a race is automatically built in. Thats to say my body goes out at what it feels like which usually borders on the edge of sane. Racing every week is totally different as I know from cross-country season when you run something like 12 races week after week. Keeping your head in the game becomes spotty and more attention must be paid to the mind and body. I still try to push as hard as I can this time of year but as I said it's only 12 weeks , not 50 races and 1 year. You know yourself best Bob and should do what you feel most comfortable with towards your 50 race goal. With some of the splits I have seen you run (6:30 last mile in the Zippy on a bad day...your words) I think it would be interesting to see if you could go 6:20. You would be passing people like crazy (probably, but know nothing about the race). If you went around 7:00 and 6:40 for the first 2 miles you would still have a good time. No need to fret about it however. Exactly...racing "all out" every week will take a toll both physically and mentally. Physically, you can turn this into a 1-1.5 mile hard run by running a very comfortable pace (for you) the first mile...will also get you warmed up better...the next .5-1mile is a gradual build in tempo...then see what you can do the rest of the way to the finish. Don't set an overall time goal. Of course this is like asking a life time smoker to stop cold turky. I have run 20 so far all out...I don't know how else to race...and this is what makes my 50 race Challenge more interesting...dealing with injuries, burn-out, stress, etc....certainly keeps it more interesting...race 21 this weekend!!! I think what Barry is saying is that you can't run each race all out. Very true...has been that way his entire life. Would love to see him try splits like 7:00/6:40/6:20 plus or minus 5-10 seconds on each. You are a great asset to the Fit Club Richard. Hope we can meet in person some day. I am having lunch with Bob Thursday. Will discuss but you know Bob. He is all out. But that's what makes him such a force. Richard, we did this also back in the days at K-State. Bob, I don't want to be the cause of you missing your goal but would like to see you try some negative split running and not your "bank it early" style. It will take a different mental approach but, as Richard says, you will still be under your goal. In your next 5k try a first mile at 7:00-7:10 which should seem to be an easy pace based on the splits I have seen. Then pick up your tempo through the last 2 miles gradually with your last mile being the fastest. Don't worry about where you place but you will surprise yourself with how well you will run. Probably will feel better afterward...and recover faster. Your biggest danger in reaching your goal is over-racing. Can lead to injury and/or mental exhaustion. Have some fun on a few of these. If I were running 50 races in a year I would not try to run each one all out. You only have so many really good races in you over a year. I would aim to be fresher for the longer races which are your strength and run the shorter races as Barry described. You'll still be well under your seven pace goal on those. Barry, back in the day I used races all the time in place of speed workouts. I called them 95%ers. I would not run them all out but during the race I eould move from tempo to more race-like efforts. I did much better off of these thsn track workouts which tended to tear me up. As you know, I am racing nearly every weekend this year between 5k and half marathon...it can be tough when you don't hit your goal but you have to shake it off and move to next week. My 5k and 4 mile time in this weekends half was almost as fast as I have been racing those distances...what do you think about that? I wear cycling gloves on trails. I am ready to Rock the Parkway...first race in Kansas since 1969! I really like this half marathon. Thanks Dave Rhody and company, Pamakids and Buzzword Productions for doing the timing. It was a perfect day for racing in San Francisco!!! 10 Ujena Fit Club members ran some good times!!! I am still trying to figure out what is going on with my hamstrings. I don't call these issues injuries...I call them situations and I do think there is always a solution to every situation. At least I am still racing...BUT I still do have situations!!! Thanks Hal for your tips...like your advice!!! 62-year-old Gary Romesser really ran a good half marathon in Naples with 1:23:10. 63-year-old Terry Mafr even ran better age-graded with a 1:32:21. That's is 96.19% for her. Congrats everyone. Looks like a fast race!!! It took a PR but Meb pulled off a great victory today. The top three London Olympic qualifiers all finished under 2:10...first time in US Trails history! I have added this race to the 50 I am running in 2012. I have not raced in Hawaii since I ran the Honolulu Marathon back in 1983 or so. I am running this half in Kauai...thanks Jeff! Thinking about making this one of my 50 races that I am running in 2012. Just viewed the course and it looks beautiful. If I was still racing marathons I would put this one on my list but don't you think it is time that someone breaks the course record that has been around since 1987? There are few races that give prize money to the top age-graded finishers...I like this!!! Any of our Ujena Fit Club members running this one? I have run this half several times and it is one of my 50 races I am doing in 2012. It such a great way to see the city of San Francisco. There are some tough hills, so don't plan on running a PR. This sounds like a good workout...once I am back 100% I want to try it. Maybe we can do it together at Foothill? The day before in Houston is the Olympic Marathon Trials...we will have a writer and photographer on scene to cover the action. Our writer, Dave Ross, a Ujena Fit Club member will be running on Sunday. Justin Whitlow is our photographer, see some of his work in our Best Shot Challenge gallery...going to be a good race! There have been some good times run on this course but the hill in the photo looks like a long one? A lot of fast times. Congrats Terry on your 56:38 at age 62. Missed you at the Napa to Sonoma Half marathon this year. You have had a great year! We noticed that you had a Joanne Helm finishing in a time of 42:00 at age 55. We don't think this time is correct and we think the person listed is the first 50-59. You should check this out. I really am thinking about running your event some day. For some reason I have never raced 15k but I want too. I like the distance. This is one race I would like to do. Like the fact they also spread out their prize money. Since the KT tape won't stick I may try some duct tape. I have a roll in the garage. By the way, I would have used the KT tape in Cabo if I had it but I only had Duct Tape available. Anyone else doing any taping? 5x3 inches, 2 AAA batteries.. Internal memory in case batteries go bad. What is the size and weight? What kind of batteries does it use?